The above equation is energy per unit wavelength per unit solid angle. This applets will show six black cureves of blackbody radiation curve betwen Tmin and Tmax. 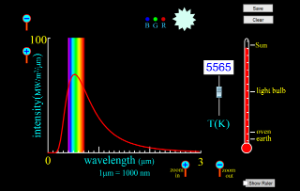 Maximum wavelength shown can be adjusted with right slider bar. You can use it for study the intensity for blackbody radiation. If you want to study different temperature range, You can change Tmin and Tmax, to change the temperature range,too. The wavelength unit in the simulation is Å (angstrom). is the spectral energy density function with units of energy per unit wavelength per unit volume. just wondering if it is a good idea to allow temperatures from 300K minimum. Tmin an Tmax are text field, so you can enter your own range. But the intensity will change a lot. So you might want to change to log scale to view all the range. The yscale can be changed between 0-100 with slider at the right side. question: where can i find the equations to verify the calculations used? like wikipedia or other physics sources. h4 = 4. *h*1.e47 = 2.65008.e14 // what is this? cst = h*c/(k*1.e-10) = 1.43.e8 // // what is this constant? what i am trying to do. i am guessing i need to change h4 = 4. *h*1.e46 for the nanometer calculation, i am guessing your calculation are for Ångström metre. some references i look at. cst= hc/k; add 1.e-10 because I use Ångström instead of m as unit for length. i tried changing the X format to 0000 but doesn't seem to work the way i hoped. I guest you were using auto-scale in the drawingPanel. Set up your xmin,xmax properly. You should be able to get what you want. Try it by yourself first. You will get to know it better. but is it possible to display 4000 instead of 4.0x10^3 ? There are X Format/Y Format properties, but I can not find any document at paco's web site. I have never used that before. If I really need it, I will use drawingPanel instead and I can draw those grid lines/labels with build in GUI elements. May be it can be done by setting proper value for X Format, but I do not know. Sorry! Maybe it can't be done yet. I will explore abit more and move on to other parts of XML . The axes do not allow formatting the ticks. The Format X property refers to the way the coordinates of the point appear (in a yellow box at the lower left corner of the panel) when you click on a point in the panel. I am puzzled by the equation used. I look at the equation and i look at the equation in the XML fT = "h4/((Math.exp(cst/(r*T))-1)*(r*r*r))"
shouldn't fT = "2*h*c*c/((Math.exp(cst/(r*T))-1)*(r*r*r*r*r))" ? strangely i tried to implement the new fT ="2*h*c*c/((Math.exp(cst/(r*T))-1)*(r*r*r*r*r))" but the graph is very low and flat and near zero in value. The above equation is a normalized function, i.e., integration will give you 1. So you can multiple it by any number. If you change the y-axis to log-scale, you will know how big/small it is. but i am puzzled by the missing r*r.
equation in your XML : fT = "h4/((Math.exp(cst/(r*T))-1)*(r*r*r))"
unless when normalized the r*r is absorbed? then it make sense to me now! I don't really know why now but at least i can accept the logic. (it that correct ?)......hahaha. Maybe i lack the prior knowledge, sorry! Sorry! It should be proportion to λ-5. The previous version was not correct. It is fixed now. what is the unit of the intensity? can explain what is your applet's? I modified the code again. The unit for the intensity is change to W/(m2-Å), where Å is angstrom 10-10m. 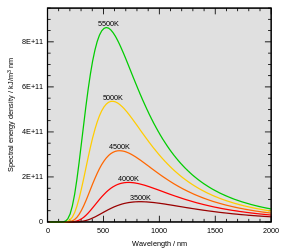 is spectral energy density function with units of energy per unit wavelength per unit volume. In school, i taught intensity = power / area. so actually what the y-axis is displaying is intensity/ wavelength ? is spectral energy density function with units of energy per unit wavelength per unit area volume. What is shown in the simulation is . It is the emitted power per unit area of emitting surface, per unit solid angle, and per unit wavelength (in unit of Å :angstrom). If integral over all solid angle, it need to be multipled by 4*π. Any tips which text do i used? A 2D text ? or a set of 2D text? i suspect conceptually, i need to differentiate fT w.r.t. math_failure (math_unknown_error): \lambda \ , equate to zero for the turning point for the highest position PosX, sub back to get the PosY. But i dunno how to do in programming. Use TextSet instead of adding Text one by one. You can calculate the differentiation directly by yourself or find out equation for the highest point from wiki page: Tmax=constant/lambda. amazing ! i will study you codes with the new additionals of text. My attempt at making a remix for nanometre 10-9 m instead of angstrom 10-10 m.
// This function peaks for hc = 4.97λkT, a factor of 1.76 shorter in wavelength (higher in frequency) than the frequency peak. It is the more commonly used peak in Wien's displacement law.